Photograph by Roger Stalley. 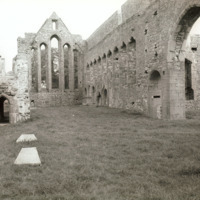 View of east cloister walk. The arcades are subdivided into bays of three arches by two chamfered buttresses with chamfered capitals and four - centred arches with chamfered voussoirs. 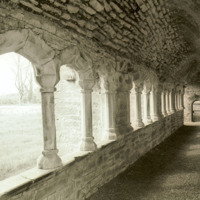 The cloister has a pointed vault of rubble masonry.